Overhead readers hold the promise of providing a continuous near real-time view of inventory on the store floor, including the location of each item. We discuss how we get to that promise from here. Part three of this series laid out a roadmap starting with inventory management using handheld readers to a broader set of use cases (such as omni-channel, display/promotion management, supply chain, and loss prevention) using other technologies (such as POS readers, door readers, and overhead readers). Here in the fourth and final article in the series, we look at how to get to the ultimate vision of continuous real-time visibility in the store, and all the advanced use cases that enables. Overhead readers hold the promise of providing a continuous near-real-time view of inventory on the store floor, including the location of each item. Customer Experience—ability to personalize and improve the customer’s experience. Analytics represents one of the greatest opportunities for retailers to decode shopping and inventory patterns in ways we had not previously imagined. We are only at the beginning of realizing the kinds of benefits that can be attained using RFID data analytics, and expect this to be an enormous area of opportunity and creative value realization. Provide planogram compliance monitoring, or in more advanced cases, allow a locally/store-driven approach to planogram decisions, while providing information about those decisions and performance back to corporate headquarters. Overhead readers are moving toward maturity and will eventually become part of a more comprehensive system that integrates all sorts of sensors and data (e.g. video, EAS, traffic counters, barcode, Bluetooth, WiFi data, and more) as part of a complete ‘instrumented store’ strategy. This has the potential to provide deep, precise, real-time insight into exactly what is going on in the store—with individual shoppers, items, and store associates, and the interactions between them—and provide alerts and recommended actions, potentially based on machine learning algorithms. Overhead readers are currently being used in a variety of proof of concept or pilot projects in retail.1 As such, it will take time to work through the technology challenges, learn what works and doesn’t work, figure out how the retailer’s processes may need to change, integrate the systems, develop the analytics and algorithms, and generally mature the technology. One of the issues for overhead readers is the physical challenge of their fixed nature in the context of the varied and changing environment of the store. For example, metal shelves might at least partially block the view of an overhead reader, whereas a trained associate can get in with a handheld and point it at a variety of angles and positions relative to the shelf to accomplish a more complete read. If readers installed are optimized for the current store layout, they might not work as well once the layout is changed. These are not insurmountable challenges, but will take time for the industry to fully understand and address. Another challenge is how to make sense of intermittently inconsistent data generated by overhead readers, which can be confusing if taken at face value. Retailers and solution providers are still in the early stages of learning how to utilize the stream of real-time data being generated by continuous overhead readers. This requires algorithms and machine learning approaches that are still being developed. Better interpretation of the data will also come from developing analytics that combine data from the broader set of store systems to drive optimal business decisions. These challenges are showing signs of being worked out; for example, there have been promising recent improvements in the performance of overhead readers, allowing them to achieve and maintain as good, or in some cases better inventory accuracy2 than handheld readers. However, challenges in cost, flexibility, support, and data integration remain to be fully resolved. Overhead technology has considerably higher upfront capital costs compared with handhelds. However, there is potential for that to be offset by lower labor cost, since the overhead approach can dramatically reduce or preferably eliminate entirely the need for cycle counting by store associates using handheld readers. Overheads also provide additional value in that they remove the need for training and compliance monitoring that is required to achieve and maintain results with handhelds. The industry is in the process of figuring out and learning when and how handheld inventory counting can and should be replaced or complemented by the automatic sensing of overhead readers. Most retailers will start with handhelds and then evolve to a hybrid/mixed-method approach. Their initial investment in handhelds does not go to waste; it is complemented by, rather than replaced by, the latter stages of infrastructure. A retailer might add transition door and exit readers to track movements from front to back or out of the store, while still using handhelds for cycle counting. Next, overhead readers could be installed in select departments where the real-time visibility provides the highest value via loss prevention, customer behavior analytics, more real-time replenishment, customer service, or some combination of these and other use cases. For those departments, the overhead readers may take over the cycle counting, but the retailer retains the handheld readers (for cycle counting departments/categories not covered by the overheads) and the door-mounted readers (continuing to provide inventory movement information). Even once an entire store is covered by overhead readers, handhelds still have a role to play for retagging of items, locating specific items, exception processing, and cycle counting in areas that are not reliably read by the overhead readers. Using handheld RFID readers to optimize the process of inventory management has become the accepted starting point for retailers wishing to begin the transition to RFID-enabled processes. It is the most common combination of use case and reader infrastructure in retail today. For certain categories of merchandise—particularly high-mix-complexity apparel and footwear categories—there is a proven dramatic ROI from implementing RFID-based inventory management. Sales uplift typically averages 8% to 12% in these categories. For items with at least $3-$5 of gross margin, this makes a very compelling business case. These improvements are being achieved by many retailers today, using proven handheld reader technology that provides a strong foundation of experience and success to build on. As retailers realize these RFID benefits, they are further investigating and investing in a broader set of reader technologies that can be applied to a wider set of use cases, like display management, omni-channel enablement, loss prevention, supply chain management, and sample management. Today’s omni-channel retailers need visibility and inventory accuracy across their whole supply chain to ensure accurate fulfillment and on time delivery. Increasingly retailers are broadening their reader infrastructure to hybrid approaches, combining their existing handheld RFID readers with transition/zonal readers, tabletop and POS Readers, and in a few cases RFID Kiosks and mirrors. 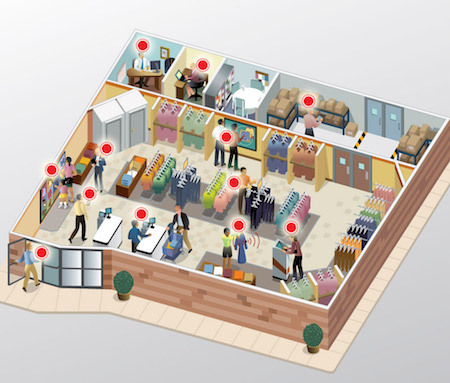 RFID-enabled processes continue to expand into new categories, departments, and applications. As the use of RFID widens, it becomes increasingly valuable to automate the primary function of RFID data capture, removing manual RFID processes from the hands of store employees. Not only will this automation better standardize the process of data capture, but it also can simplify the job of the store associate, reducing the need for process training, removing the potential for compliance problems, and enabling store employees to better focus on higher value tasks like customer service. It is clear that overhead readers offer the greatest potential to automate the capture and management of RFID data. In doing so, overhead systems can further extend the value of RFID into new areas and become the heart of an integrated information management platform. This platform will be able to provide retailers with the same level of visibility and analytics about shopper motivation and behaviors in the store that they have with web shopping, so they can keep stores relevant, attracting a new generation of shoppers. The continuous stream of location-aware RFID item data from these overhead systems can ultimately be combined with data from other systems—video, traffic counters, EAS, and other sensors—using big data analytics and machine learning technology to fulfill this next generation vision. These technologies all exist today and retailers are increasingly learning how to use them in an integrated fashion. Clearly, RFID reader infrastructure, like any technology, will continue to evolve and mature in ongoing cycles of progress. With increasing numbers of pilot deployments, overhead reader systems are maturing at a rapid pace. The handheld and fixed reader based solutions of today will incrementally expand, and then naturally transition over time into the overhead based solutions of tomorrow. While retail business goals may remain the same, the mix and balance of technologies and products to achieve those goals will shift over time. However, the ongoing evolution of RFID should not become a justification for delayed investment. The solution providers and early adopters who first started down this path have paved the way with flexible, cost-effective handheld reader products that bridge the gap between the worlds of barcodes and electronic product codes (EPC). These handheld RFID readers offer a simple starting point—a way to easily optimize the inventory management process and generate proven benefits. The good news is that for retailers who wish to adopt RFID and quickly reap its rewards, there is a clear and rapid road to value. That road has been well traveled. The risks are low. The decisions are simple. RFID delivers higher sales and greater profit. With so much intense competition in the retail space, retailers can’t afford to wait to realize these improvements.